from the quayside, we set of on our most popular wee tour. First stop is the spectacular view point called 'Millionaires View'. From here you can see what typifies Scotland: Lochs, Glens and Mountains. Then onto the Falls of Shin, it is a fantastic place for a wee walk through the ancient forest to watch the Atlantic salmon leaping up the waterfall. Then on through Strath Fleet and onto the breathtaking Dunrobin Castle. 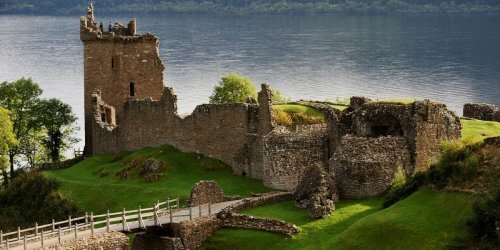 The castle dramatically unveils itself to you at the end of a long, tree-lined drive. It dates back to 1275 by Robert, 6th Earl of Sutherland, but its present outward appearance results from extensive changes made from 1845 to 1850. The impressive house contains 189 rooms, with a rich collection of fine furniture, paintings, tapestries and objets d’art. The castle is magnificently set in a great park and you are free to walk in these beautiful gardens which overlook the sea. 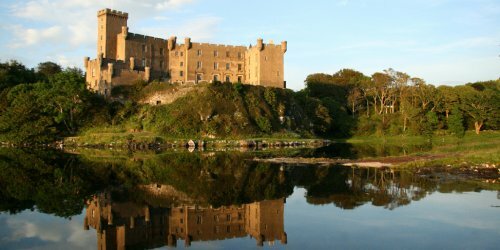 From Dunrobin Castle we shall travel south towards Dornoch, famed for its red sandstone buildings, beach and golf course. From here we will travel towards the Glenmorangie Distillery, we pass over the Dornoch Firth, and the Distillery is situated on the outskirts of Tain, the 'Oldest Royal Burgh in Scotland'. If you do not wish to visit the distillery, then I can take you to explore the Old Burgh. 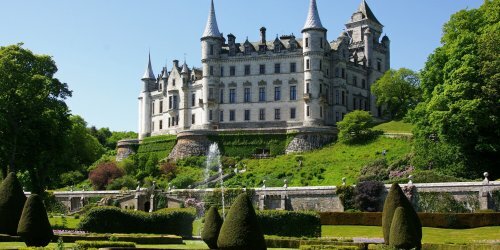 Once you have disembarked, for your day tour to Dunrobin Castle, Dornoch and Glen Morangie Distillery, your guide will be waiting for you, and then, your day, your way, will begin. After a short journey, we will arrive at the famous 'Falls of Shin' - a series of stunning natural waterfalls, where we can hopfefully view (season dependant, July-Setember) Atlantic Salmon leaping up the waterfalls, making their way 'home' to Loch Shin, where they will find a girlfriend and let nature take its course. 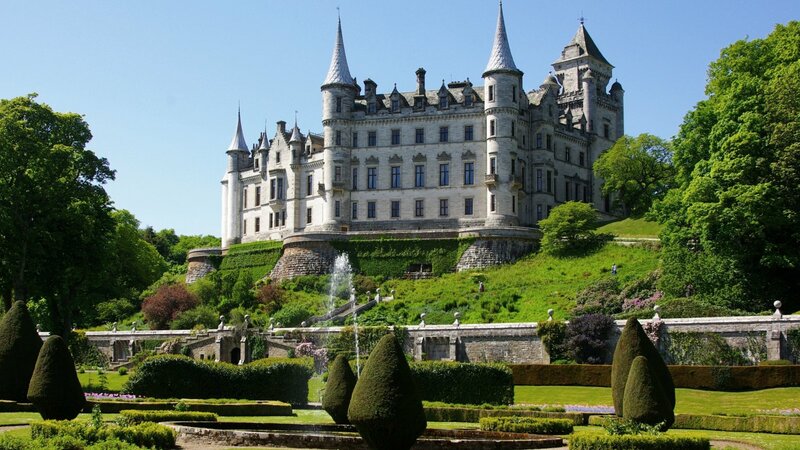 A big attraction of Dunrobin Castle is its falconry display. Andy Hughes, is the castle's resident Falconer, and he demonstrates and explains the different hunting methods used by owls, hawks and falcons. It could possibly be one of the only times you will get up close and personal with our own Golden Eagles, Peregrine falcons and the exotic European Eagle Owl. When it is time to go, we will start to head south, and our next port of call is the Royal Burgh of Dornoch. The name 'Dornoch' is derived from the Gaelic for 'pebbly place' . It boasts the furthest north Cathedral on mainland Scotland dating back to the 13th century, with the first service taking place in 1239. For the golf enthusiast, it has one of the Top 10 courses in the world. On 21 December 2000 the pop star Madonna had her son Rocco christened in Dornoch Cathedral, the day before her wedding to Guy Ritchie in nearby Skibo Castle, the original holiday home of Andrew Carnegie. Our final stop of the day, Glenmorangie Distillery known in the Gaelic as 'The Glen of Tranquility'. It has been producing Single Malt, by the 16 Men of Tain since 1843. A fantastic tour awaits. From here it is a wee journey back to your ship, we will return at about 16.45.